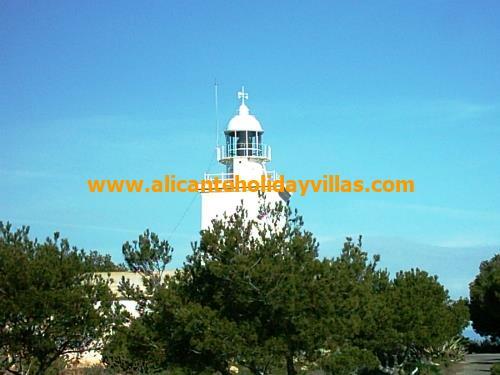 A short walk (10 to 15 minutes) from the topmost section of Avenida Escandanavia in Gran Alacant, following paths amongst pine trees, you will find the Faro de Santa Pola, or Santa Pola lighthouse. If walking please wear sturdy shoes, flipflops will not suffice! Alternatively, there is a straight road to Santa Pola lighthouse of around 4km from the N332 road inbetween Gran Alacant and Santa Pola. This is signposted Cabo de Santa Pola. Built in 1858 on the old Atalayola watchtower which was previously built in 1552 and with a scope of some 16 nautical miles, the views across to Alicante and also to Tabarca Island are simply breathtaking. On clear days and with binoculars, you can also see Benidorm. From here you will also be able to see the paragliders taking off from the cliffs at nearby Gran Alacant and watch them glide through the skies. In 2015, Santa Pola Council invested 300,000 Euros in building a 100m metal skywalk(or viewing point) close to the Santa Pola lighthouse, further enhancing the view and your ability to take photos at a higher angle. There are no cafes or shops at the Lighthouse, so please ensure you take water with you!